But, before I start to talk about our vineyard, I need to set the stage on our location and the space that we had available to us. The French and many traditionalists believe deeply in ‘le goût du terroir.’ To take this term literally, the meaning of terroir apparently is that wine should have a distinct, identifiable taste of place, locality, or region – that is, it would actually taste of the predominant soil type of the vineyard, with flavor components that are reminiscent of slate, chalk or minerals, or in other cases just general earthy notes. The underlying assumption behind this concept is that the vine roots transfer flavor-bearing elements directly from the soil to the developing grapes. Figuratively, terroir can be treated conceptually as an ethos or philosophy. It's a unifying theory encapsulating a certain approach to wine that encompasses the almost metaphysical circle of soil, nature, appellation and human activity. As a philosophy, this view clashes with the reductionist new world grape-variety and 'winemaker'-dominated approach. Together, then, terroir translates to the ecology of a wine. The total, inter-related environment where a grapevine is cultivated for the purpose of making wine. Key factors include, but are not limited to, cultivar type, soil, climate, vineyard location, planting density, training system, pruning philosophy & the cultural and social milieu wherein the whole enterprise takes place. So, what is our ‘terroir’ like? Our house is located about three miles from downtown Seattle right on the edge of a hogsback ridge – a ridge that falls off on both sides – with a virtually unobstructed view that looks eastward over Lake Washington towards the Cascade Mountains. On a clear day, we can see the Cascades clearly all the way to Mt. Rainier to the south. Behind our house, our yard falls eastward down the side of a fairly steep hill. By Seattle city standards in the city, it’s a large yard with approximately 15,000 square feet (just over 3/10 of an acre) of total available space although with existing trees and other details, only a small fraction of that would be usable as a garden. With the steepness of the hill, though, it was difficult to use as a play space for young children so we needed an alternative. Our soil is similar to most in Seattle – there is a relatively thin 3-10 foot deep layer of loose, gravelly soil on top of a layer of clay. In our case, the soil on the top part of our hill was also composed of the excavated dirt from the basement of our house which was constructed in 1923. When we moved into our house in 1993, the backyard was in a state of near wilderness. Access to the yard was limited. There was one old set of wood stairs that led from the patio downwards but there was no landing at the bottom – we had to immediately clear a two foot drop to get to the top of an old rock stairway. Along three sides of the yard, there are a dozen or so cedar trees planted 40-50 years ago of which almost all had been topped once. We also had one gnarly old English pine and several alder and elm trees. In the middle of the space, we had grass that had overgrown the space and, in some places, had reached four feet tall. Around the bottom of our lot, English ivy had, in some cases, had grown 30-40 feet up into some of the threes. That ‘native’ vegetation had taken over as well as we had our fair share of nuisance plants that had colonized the yard: wild blackberries, morning glory, wild clematis and more. The combination of this was overwhelming. To get from one end of the yard to the other was probably similar to walking through a clearing in the Olympic rainforest – the vines and blackberry bramble would grab us while the grass was so deep that we had little idea whether we would be stepping into a hole or stubbing our toes on rocks. We knew that we had to do something because the space in our yard was one of the reasons we had purchased the house. We knew that as our children (at the time, the oldest was one-year old and the second was still a gleam in our eyes) grew older, they would eventually love to explore this space but, at this first glimpse, they really could get lost! Fortunately, there was great potential. 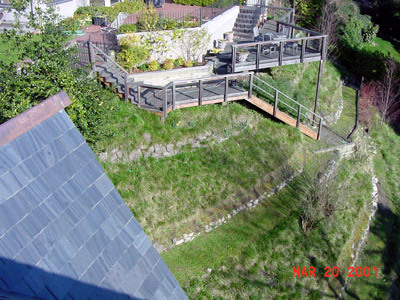 At some point in time, we guessed about 40-50 years ago, a previous owner had devoted significant effort to put in some terracing and paths around the hill. We could, just barely, see some rock stairways that were still in place and somewhat usable. A space about thirty by fifty feet had been leveled halfway between the top and the bottom of the hill – about forty vertical feet below the level where our house was. But, even with these possibilities, the overall picture was one of general neglect that comes after years of indifferent care. When we moved in, we had no ideas on what we could do with this space – and we certainly weren’t thinking about a vineyard at the time. It was enough to simply reclaim the space and make it person-friendly. We tackled the reclamation project in four distinct phases. Let me outline each phase because each choice has had an impact on the choices that we made for our home vineyard – the context for understanding the location for the vineyard and the ultimate potential for growing grapes that might have any potential of being converted into wine.